Drive north on the Winton-Jundah Road to the turn-off for Bladensburg National Park just seven kilometres south west of Winton. 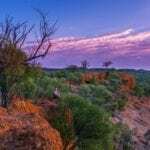 The beautiful 84900 hectare national park boasts impressive flat-topped plateaus and residual sandstone ranges which provide a scenic backdrop to vast grassland plains and river flats, river red gums and rocky scarp. Roads within the park are formed dirt roads more suited to Four Wheel Drive vehicles. Conventional vehicles can access Bladensburg only during dry weather, and a high clearance Four Wheel Drive vehicle is recommended at all times. Bladensburg National Park is open all year however wet weather may cause temporary closures. Camp beside Surprise Creek at the permanent Bough Shed waterhole. For information or permits visit the National Parks website. Departing Bladensburg National Park, continue on the Winton-Jundah Road north to Winton, in big sky country, which has a rich history as the birthplace of Waltzing Matilda and QANTAS, and links to the 1891 Great Shearers’ Strike. The region has diverse natural history and spectacular Jump Up landscapes. Winton’s attractions include the Australian Age of Dinosaurs which houses the world’s largest collection of Australian dinosaur fossils. Experience Winton’s free attractions – play a tune on the world’s first permanent Musical Fence, take a self-guided walk through possibly the last working Chinese market garden in Queensland, and marvel at Arno’s Wall where everything can be found! With five days of outback entertainment, the biennial Outback Festival is held over the 3rd week in September. The famous Winton Camel Races and the Vision Splendid Film Festival are held annually in July. 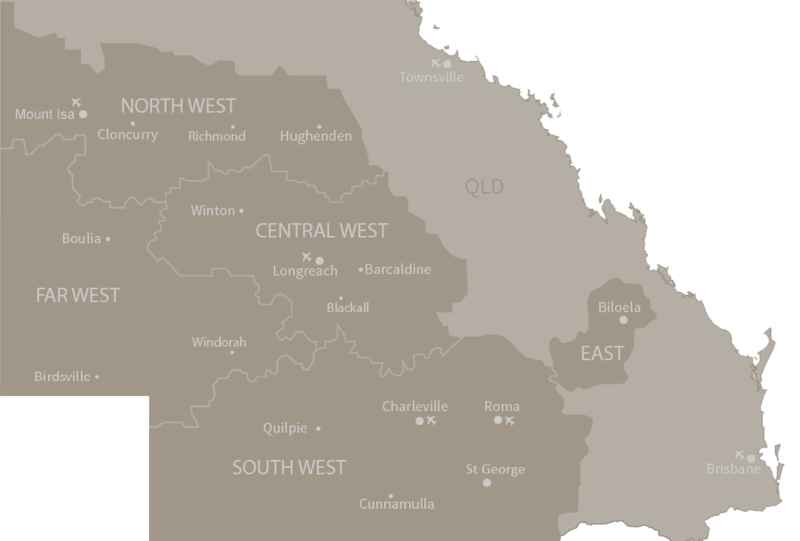 Winton is approximately 179 kilometres north west of Longreach. Rex Air operates twice weekly flights to Winton from Townsville and there is a twice-weekly “Spirit of the Outback” Rail/Coach service from Brisbane. Motels, caravan parks and free campsites are available. Stay connected with free Wi-Fi in Winton’s main street. Beginning the Trail in Boulia, visit the Min Min Encounter for a unique theatrical experience based around the famed Min Min Light phenomenon. Call into the well-preserved Stonehouse Museum, one of the first homes built in Western Queensland, which is also home to a Marine Reptile Fossil exhibit – evidence that Boulia was part of an Inland Sea 100 million years ago. See the last recognised Corroboree tree of the Pitta Pitta tribe – a distinctive Waddi tree – located near the Boulia Sports and Aquatic Centre. Drive approximately 25 kilometres out of town to the Old Police Barracks site (1875-1884). An ideal spot for fishing, bird watching and taking in the tranquility of this pretty bush setting, the campsite at this natural waterhole had great spiritual significance to the local people. The Boulia Rodeo, Races and Campdraft is a major event at Easter, and the famous Boulia Camel Races are held every third weekend in July. Accommodation options in Boulia include a hotel/motel, motel, caravan park and bush camping. Rex Air operates twice-weekly flights into Boulia from Brisbane. Nearest hire car facility is Mount Isa Airport (approximately 3 hours drive). Contact the Min Min Encounter Information Centre for information. 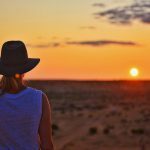 Drive approximately two and a half hours south east of Boulia to the Diamantina National Park. The Worldwide Fund for Nature has named it one of Australia’s top 10 National Parks. This 507000 hectare park is home to many rare and threatened species. Lake Constance and Hunters Gorge are important wetlands and support breeding populations of many resident and migratory birds. Diamantina National Park was formerly a pastoral holding and became a national park in 1992. In the past, Maiawali and Karuwali Aboriginal people moved through every part of this landscape. Their strong spiritual connections remain today. 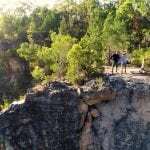 While in the park, sample a range of outdoor activities – canoeing on Hunters Gorge (own canoe), wildlife spotting, exploring the Warracoota Ruins and taking in the sights at Janet’s Leap Lookout. 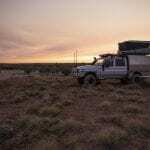 A Four Wheel Drive vehicle with high clearance is necessary as many outback roads are unsealed and wheel ruts can be deep. Take extra fuel. Open all year however wet weather may cause temporary closures. Visiting is recommended from April to September. Camping is permitted at Hunters Gorge and Gum Hole camping areas. For information on permits visit the National Parks website. Proceed north approximately 132 kilometres on the unsealed Diamantina River Road before heading east approximately 67 kilometres on the Old Cork Road to Lark Quarry Conservation Park. The Dinosaur Stampede at Lark Quarry Conservation Park is where over 3,300 dinosaur tracks mark the site of the only known dinosaur stampede on the planet – these tracks are estimated to be about 95 million years old. There are guided tours of the Trackways, which take almost an hour and a self guided Spinifex Walk takes 15-30 minutes.